Cardinals righty Carlos Martinez is planning to work back from the injured list in a relief role, manager Mike Shildt told reporters including Mark Saxon of The Athletic (Twitter link). He’s working back to full health after experiencing shoulder weakness during camp. This is a notable decision for an organization that has a good bit of cash invested in the 27-year-old hurler. ($11.5MM this year and at least $24MM thereafter.) But it was driven not by the club’s own preferences so much as Martinez’s feelings, according to Shildt. That’s an interesting shift, as Martinez had made clear previously that he wished to return to the rotation. While there’s little question that Martinez’s greatest upside would be in a starting capacity, that hasn’t seemed to be a priority for the club. Even before the shoulder problems arose, there were suggestions from within the coaching staff that it may be desirable to have him in the bullpen. Martinez has thrived in both roles for the most part, with a lifetime 3.36 ERA as a starter and 3.46 mark as a reliever. He was more effective last year from the pen, though it’s tough to draw any conclusions from such a small sample. Suffice to say that the power righty is capable of providing excellent output in any situation so long as he’s at full health. Injury concerns have trailed Martinez of late, but he has mostly been available. He made 92 starts between 2015 and 2018 and even managed to throw 118 2/3 frames despite facing a variety of health issues last year. It seems the decision — at least for now — is that he’s likelier to be of use to the club in the near term if he limits himself to shorter outings. It still isn’t known just when Martinez will be ready for activation, though it’ll likely come sooner given the decision to utilize him in relief. He has yet to embark upon a rehab assignment and that does not seem imminent, though the latest update on his condition was generally quite positive. For the Cards, there’s certainly greater need in the rotation based upon the early results. Every member of the rotation is averaging over 4.5 earned runs per nine, while several pitchers are generating strong results in the relief corps. That picture could still change, of course, and there’s no doubt that Martinez will improve the relief unit quite a bit. It’ll be interesting to see just how he’s utilized — as a late-inning hurler, floating high-leverage arm, and/or multi-inning asset — once he’s back to full speed. 4:50pm: The Cards only anticipate a one-start absence from Wacha, Mark Saxon of The Athletic reports on Twitter. 11:53am: The Cardinals announced Monday that right-hander Michael Wacha has been placed on the 10-day injured list due to patellar tendinitis in his left knee. The move is retroactive to April 19. In his place, infielder/outfielder Drew Robinson has been recalled from Triple-A Memphis. The Cardinals did not provide any indication as to how long Wacha is expected to be sidelined. Wacha, 27, hasn’t been at his best through his small sample of four starts in 2019. While he’s sporting a 10.1 K/9 mark that would be far and away a career high, he’s also averaged 5.9 walks per nine frames so far — a mark that would be a clear-cut worst. The right-hander’s velocity, swinging-strike rate and opponents’ chase rates have all gone in the wrong direction as compared to last season’s numbers, suggesting that he’ll have difficulty sustaining that strikeout rate. He’s also allowed five homers in just 21 1/3 innings after allowing only nine through 84 1/3 innings a year ago. Wacha was penciled in to start Tuesday’s game against the division-rival Brewers, so St. Louis will need to find an alternative. Daniel Ponce de Leon last started on April 17, meaning he’d be a logical substitution in Wacha’s stead for tomorrow’s game. With Carlos Martinez still ailing and Alex Reyes working shorter stints in Triple-A at the moment, the Cards are surely crossing their fingers that Wacha will be able to return to the club in relatively short order. There’s added incentive for the player himself, as well, considering that Wacha is slated to reach free agency for the first time in his career this winter. After totaling only 84 1/3 innings in 2018 and averaging just 24 starts per season in since becoming a fixture in the St. Louis rotation, a largely healthy season would bode well for Wacha, who will hit the open market at a rather youthful 28 years of age. Also from Durando, Mike Mayers – placed on the IL on April 16th – is expected to be out for “a couple of months.” Shoulder surgery is not in the offing, however, as the Cards appear consigned to rest and rehab. There was no mention of a specific grade level on Mayers’ shoulder injury, though it stands to reason based on the recovery timeline that he suffered a Grade 2 lat strain. Mayers, 27, made eight relief appearances for the Cards this season after 50 in 2018. Overall in that span, he pitched to a 4.80 ERA with a 2.85 K/BB rate. Alex Reyes has a new role in Memphis, as the right-hander has been moved into the starting rotation for the Cardinals’ Triple-A club, per MLB.com’s Jenifer Langosch. The club’s intention is to get Reyes more game time to work on his changeup and slider, though overall command consistency remains the primary goal. The plan is for Reyes to put in 40-50 pitches in his first Triple-A start, though that number could grow as he strengthens. The team says the move is purely to get Reyes more opportunity to find his stride with those secondary pitched in-game, and while in a vacuum that explanation makes sense, it’s hard to overlook potential context clues such as the ongoing struggles of the St. Louis rotation, or the continued uncertainty around Carlos Martinez’ eventual role. Reyes’s has been in the spotlight since tossing 46 shimmering innings of 1.57 ERA baseball as a 21-year-old back in 2016, though it’s been a wait-and-see game for the Cardinal faithful since then. The Cardinals announced today that outfielder Tyler O’Neill and righty Mike Mayers are both headed onto the 10-day injured list. The former suffered an ulnar nerve subluxation in his right elbow while the latter has a strained lat. A trio of reinforcements is headed onto the MLB roster: infielder Yairo Munoz along with righties Ryan Helsley and Giovanny Gallegos. This is the first call-up for Helsley. Outfielder Drew Robinson was optioned down to create the final opening. The severity of the injuries isn’t yet known, but both come with at least some potentially for extended absences. Ulnar nerve issues aren’t necessarily huge problems, particularly for non-pitchers, but the Cards will obviously want to figure out the root cause and make sure that O’Neill is fully past the problem before bringing him back into the mix. In the case of Mayers, it’s impossible even to guess at a timeline without knowing the grade of the injury, but lat strains can be rather problematic for hurlers. Cardinals center fielder Harrison Bader is currently dealing with what the team hopes is a minor hamstring injury, per Derrick Goold of the St. Louis Post-Dispatch. Bader was out of the lineup Sunday and is expected to be further evaluated today. The initial prescription for Bader was merely to rest the injury for a full day, but if the pain in his leg lingers today, he could undergo an MRI as well. The 24-year-old Bader, one of the game’s premier defenders in center field, is off to a sluggish .179/.347/.359 start through 50 trips to the plate. In a separate piece, Goold notes that righty Carlos Martinez threw a 20-pitch bullpen session — consisting entirely of fastballs — on Saturday and is expected to do so again today. From there, he’ll move to live batting practice (assuming today’s ’pen session goes well) before the Cardinals make a determination on not only the location of his rehab assignment but also the role in which he’ll pitch on that assignment. The organization is still mulling whether Martinez will pitch as a starter or as a reliever in 2019. Former big league first baseman/outfielder Allen Craig has joined the Padres’ front office as an advisor to the baseball operations department, reports MLB.com’s AJ Cassavell (via Twitter). The move officially brings Craig’s playing career to a close. Though Craig, 34, hasn’t been in the Major Leagues since 2015 with the Red Sox, he’d yet to hang up the spikes. He was in camp with the Padres on a minor league deal this spring and appeared in six games, and he spent the past three seasons with the Triple-A affiliates for Boston (2016-17) and San Diego (2018). Craig’s peak in the Majors was brief but impactful. His 2010 rookie season didn’t stand out in any way, but he burst onto the scene in 2011 when he raked at a .315/.362/.555 clip and belted 26 extra-base hits (11 homers, 15 doubles) in just 219 plate appearances. Craig played a key role in the Cardinals’ postseason exploits that season as well and was rewarded with a World Series ring. He’d follow up that strong year with a highly productive .307/.354/.522 slash and 22 homers over an even larger sample of work (514 plate appearances) in 2012. That sample was enough for the Cards to invest in Craig on a five-year extension back in Spring Training 2013. He made the move look like a bargain with another strong year in 2013, hitting .315/.373/.457 and landing his first (and only) All-Star nod. Following that three-year peak in which he batted a combined .312/.364/.500 (136 OPS+), however, Craig’s bat completely evaporated. After suffering a Lisfranc injury late in 2013, he slumped through a woeful first half of the season in 2014 and found himself traded to the Red Sox alongside Joe Kelly in the deal that sent John Lackey to St. Louis. Hitting .215/.279/.315 at the time of the trade, Craig saw his troubles grow even more pronounced with his new team. In 195 plate appearances with Boston from 2014-15, he mustered just a .139/.236/.197 line before being designated for assignment and outrighted off the 40-man roster. He’d finish out his extension in Triple-A before landing with the Padres in the 2017-18 offseason. It’s not fully clear what Craig has in mind for the next phase of his career. As an advisor to the baseball ops department he could follow the path recently taken by former Rays right-hander Brandon Gomes, who is now an assistant general manager with the Dodgers. That’s but one of many roads to explore in retirement, though; current Astros manager A.J. Hinch worked in the San Diego front office, for instance, providing another potential blueprint for Craig’s post-playing days. Whatever “The Wrench” has in store for him, he’ll embark on that journey with a career .276/.333/.435 batting line, 59 home runs, 107 doubles, three triples, 239 runs scored and 296 runs knocked in over the course of 534 big league games. Brief as his career was, he earned about $32MM as a player, made an All-Star team and captured a World Series ring — a successful slate of accomplishments if there ever was one. Best wishes to him in the next chapter of his baseball career. 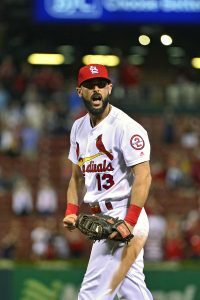 The Cardinals have locked up a key member of their lineup and one of their longest-tenured players, announcing on Wednesday the signing of infielder Matt Carpenter to a two-year contract extension spanning the 2020-21 seasons. Carpenter, a client of SSG Baseball, will reportedly earn $39MM on the new arrangement. He’d previously been signed through the end of the 2019 season with a club option for the 2020 campaign. Carpenter will reportedly take home annual salaries of $18.5MM in 2020 and 2021, with a vesting option for the same amount triggering if he makes a combined 1100 plate appearances in 2020-21 (with at least 550 of those 1100 coming in 2021). If the option does not vest, it’ll function as a pure club option with a $2MM buyout. Carpenter will also pick up a no-trade provision for the 2020 season. Carpenter, 33, is coming off of a stellar 2018 season in which he posted a hefty .257/.374/.523 slash line with a career-high 36 home runs. He has turned in well-above-average offensive work in every one of his seven full seasons in the majors. The new deal comes as Carpenter’s prior pact neared a conclusion. His early 2014 extension included a $14.5MM salary for the current season along with a $18.5MM club option ($2MM buyout) for 2020. Carpenter joins newly acquired first baseman Paul Goldschmidt in signing on for the foreseeable future. There’s risk in locking into two such corner pieces into their mid-thirties, but both are immensely productive hitters. With that duo now under control through the 2021 season at the very least, it seems that Carpenter will continue to hold down third base for the Cards for the foreseeable future. Carpenter has some experience at second base as well, but the Cards already have a premium defensive option at that position, Kolten Wong, under contract on a long-term deal of his own that runs through the 2020 season and contains a club option for 2021. That $19.5MM annual value on the new contract won’t put the Cardinals near the luxury tax threshold but will boost the amount of money already committed to next year’s payroll to a hefty $147MM. Fortunately for the Cards, they’re likely ticketed for a small class of arbitration-eligible players, as only John Brebbia, Alex Reyes, John Gant and Dominic Leone are set to receive arbitration raises. Of that quartet, the first three will be eligible for the first time. The Cards will also face a $13MM option ($1MM buyout) on infielder Jedd Gyorko. With Carpenter now locked into place, the Cardinals suddenly look to have nearly their entire 2020 lineup in house. Goldschmidt, Carpenter, Wong and Paul DeJong are all under contract for next season, as is franchise icon Yadier Molina. Harrison Bader has cemented himself as the team’s center fielder, and although Marcell Ozuna is slated to hit free agency, he’s expected to be replaced by Tyler O’Neill in 2020 and beyond. Dexter Fowler remains under contract through 2021 and figures to handle a corner position unless he struggles through a similarly nightmarish campaign to the one he experienced in 2018. The Cardinals’ system has a few quality third base prospects, led by 2018 first-rounder Nolan Gorman, but most of the team’s talent in that regard is still multiple years from MLB readiness. It’s possible that Elehuris Montero could’ve been ready for a look in the Majors late in 2019 or at some point in 2020, but he’s still just 20 years of age and only getting his feet wet in Double-A. Gorman has yet to play above A-ball, while well-regarded 18-year-old Malcom Nunez will start his pro career in Rookie ball this summer. By the time Carpenter’s contract is nearing its conclusion, perhaps one of those promising young players will be on the cusp of the big leagues, but the lack of an immediate heir-apparent likely further pushed the Cards into keeping Carpenter on board into the 2021 season. The Cardinals originally announced a press conference earlier this afternoon. Derrick Goold of the St. Louis Post-Dispatch broke the news that the presser was to announce a new deal for Carpenter. MLB.com’s Jenifer Langosch reported the length of the contract (Twitter link). The Athletic’s Mark Saxon reported the terms of the deal (via Twitter), with Goold adding the yearly breakdown and 2020 no-trade protection. First baseman Albert Pujols dominated headlines in 2011 when he elected to leave St. Louis, where he spent the first 11 seasons of his Hall of Fame career, for the Angels’ 10-year, $254MM offer. Pujols’ decision came after the Cardinals and Marlins also proposed decade-long contracts worth upward of $200MM. Now 39 years old and with $87MM remaining on his deal, Pujols recently reflected on his choice to leave the Cardinals, telling Graham Bensinger (via ESPN.com): “I felt that the approach that they took wasn’t showing me that they wanted me to be a longtime Cardinal. I believe I made the right decision.” If his rapid deterioration in Anaheim is any indication, St. Louis dodged a bullet in losing Pujols, even though he won three NL MVPs and two World Series as a Cardinal. Pujols slashed an incredible .328/.420/.617, averaged more than seven fWAR per year and never appeared in fewer than 143 games in a season while with the Redbirds. On the other hand, the Anaheim version’s a .260/.315/.452 hitter who has been worth one win above replacement a year and has twice missed at least 45 games in a season. Martinez added the Nationals are “going to need Rosey,” who was their most noteworthy bullpen addition of the offseason. Thanks to a successful run with the Cardinals from 2012-17, Rosenthal’s earning a guaranteed $7MM this season with Washington, which took a chance on him in the wake of his injury. His return has gone about as poorly as possible thus far, of course, though Rosenthal’s hardly the lone problem in the Nationals’ bullpen. The unit entered Sunday with a league-worst 10.02 ERA and nearly blew a 12-1 lead before hanging on for a 12-9 win. The Cardinals demoted highly touted righty Alex Reyes to the minors Saturday, but they don’t plan on having the 24-year-old come back as a starter this season. Building up Reyes’ workload is “not even close to on our radar,” manager Mike Shildt told Derrick Goold of the St. Louis Post-Dispatch on Sunday. Rather, Reyes will typically total two innings and 30 to 40 pitches per Triple-A appearance, Goold explains. The goal is for Reyes to function as a late-game, multi-inning reliever when he heads back to St. Louis, though there’s no timetable for his return to the majors, Goold reports. Southpaw Andrew Miller looks more like the second coming of Greg Holland than the savior the Cardinals’ bullpen was hoping for this season, Ben Frederickson of the St. Louis Post-Dispatch observes. Signed to a two-year, $25MM contract over the winter, Miller has given up six runs (four earned) on five hits (three homers) and four walks, with just two strikeouts, in his first 3 1/3 innings as a Cardinal, thereby mimicking the awful performance Holland registered last season after inking a one-year, $14MM deal. While it’s clear Miller has looked nothing like the dominant force he was with the Red Sox, Orioles, Yankees and Indians from 2012-17, it’s obviously far too soon to write him off as a bust. Fortunately, both Miller and Cardinals president of baseball operations John Mozeliak insist the 33-year-old is healthy after knee, hamstring and shoulder injuries plagued him in Cleveland last season. The Cardinals have optioned righty Alex Reyes and utilityman Yairo Munoz to Triple-A Memphis, according to Derrick Goold of the St. Louis Post-Dispatch. Corresponding moves haven’t yet been announced. Reyes will received “scheduled work” in Memphis, Goold notes, rather than his irregular deployment out of the Cards’ bullpen over the first week of the season. This usage could be a reason for Reyes’ struggles. as the 24-year-old has allowed five earned runs over his three innings pitched this season for an ugly 15.00 ERA. Reyes has allowed runs in each of his last three outings, including a rough frame of work on Friday that saw him surrender a Fernando Tatis Jr. homer as well as three walks, leading to three Padres runs. One of the game’s most heralded pitching prospects, Reyes burst onto the scene with 46 innings of 1.57 ERA ball for the Cardinals in 2016, but has since barely pitched. Tommy John surgery sidelined him for all of 2017, and Reyes only amassed 27 total innings in the minors and majors in 2018 after tearing a tendon in his right lat. A more steady workload could be the best move for Reyes as he continues to get his career back on track, and it seems likely that he’ll be back in St. Louis at some point this season after he begins to string together some good results. Whether that return would be as a reliever or as a starter may depend on the status of the Cardinals’ rotation members, though Reyes could again be seen as a potential multi-inning relief weapon for late in games. Two pitchers are likely to be added to the 25-man roster, Goold writes. Since the Cardinals were playing with a five-man bench, Munoz became expendable as the team looked to add an extra arm to the bullpen. Munoz has five plate appearances over four games for St. Louis, making one start and mostly coming off the bench as a pinch-hitter and late-game defensive sub. The 24-year-old Munoz was a valuable bench piece for St. Louis last season, hitting .276/.350/.413 over 329 PA in his rookie season while seeing time at six different positions. Cardinals left-hander Brett Cecil underwent surgery this week to alleviate carpal tunnel syndrome in his left wrist and through his forearm, per Derrick Goold of the St. Louis Post-Dispatch (Twitter link). Cecil, 32, wasn’t expected back until at least the end of May after being placed on the 60-day injured list when the club claimed right-hander Merandy Gonzalez off waivers on Opening Day. Whether this injury substantially pushes back his timeline isn’t yet clear. Because the surgery isn’t common among big league pitchers, there’s little in terms of historical precedent to use as a barometer. David Price’s carpal tunnel issues were a storyline last season, but the Red Sox lefty didn’t undergo surgery. Signed to a four-year contract in the 2016-17 offseason, Cecil logged a respectable 3.88 ERA in 67 1/3 innings in his first season with St. Louis but posted a 6.89 mark over 32 2/3 innings during an injury-shortened 2018 campaign. He began the season on the shelf due to a shoulder sprain and would later miss time due to a foot injury as well. The Cardinals still owe Cecil the remainder of this year’s $7.5MM salary as well as a $7MM salary for the 2020 season. Cecil’s injury currently leaves Andrew Miller as the only left-hander in manager Mike Shildt’s bullpen, though the Cards also have lefty Tyler Webb in Triple-A and on the 40-man roster should the need for a second southpaw become more pronounced. Cardinals left fielder Marcell Ozuna was scratched from Wednesday’s lineup after experiencing pain in his torso, Derrick Goold of the St. Louis Post-Dispatch reports. Goold further tweets that Ozuna is headed for an MRI tomorrow, and manager Mike Shildt expressed some concern about a potential intercostal strain. It’s a frustrating development for both team and player, as Ozuna was hoping to bounce back from an injury-marred 2018 season in which ongoing shoulder issues hampered his swing. The Cardinals, meanwhile, were hoping that a healthier Ozuna could pair with offseason acquisition Paul Goldschmidt to bolster the middle of the batting order. If Ozuna needs to miss time, Tyler O’Neill could step into a larger role with the club, and Jose Martinez (who started in place of Ozuna today) could get some additional at-bats as well. The Cardinals added a major star via trade but otherwise largely doubled down on their existing roster as they seek to break an uncharacteristic string of postseason-free campaigns. The Cardinals have rolled off eleven-straight winning seasons, which is really quite an accomplishment. But the last three of those campaigns have ended without a posteason berth and the club last won the World Series in 2011. It’s hardly an epic drought, but this is an organization that holds itself to a high standard. The problem, arguably, was that the club has of late lacked truly premium players on an otherwise deep and talented roster. In 2018, no St. Louis player reached five wins above replacement, as measured by Baseball-Reference. The organization seemed like a prime contender to chase after superstar free agents Bryce Harper and Manny Machado. Instead of dangling $300MM+ contracts to those younger players, the Cards coughed up some of their solid young MLB assets in a swap that brought in outstanding first baseman Paul Goldschmidt from the Diamondbacks. Luke Weaver has at times looked like a quality, mid-rotation hurler; Carson Kelly at one point seemed the long-term replacement for Yadier Molina. Both will now seek to stake out a career in Arizona while their new team mourns the departure of an all-time franchise great. That acquisition only brought the Cardinals one year of control over Goldschmidt, who was slated to test the open market next winter. But he and the team cozied up quickly and worked out a contract that meets the needs for each. Defensively limited sluggers just don’t earn like they used to. Goldschmidt turns 32 this September, so he’s hardly youthful. And he’ll take home a bigger deal (albeit without the opt-outs) than that secured last winter by top slugger J.D. Martinez (five years, $110MM). It’s sensible for him to take the money now and understandable that the club was willing to pay something close to open-market value to ensure they keep their new lineup centerpiece. The other major deal struck by the Cards this winter went to an existing player. Having struck gold with their signing last year of starter Miles Mikolas, the team doubled down with a lengthier contract. It’s a manageable risk at $17MM annually over four years, but also represents a good bit of faith in a pitcher who had not even cracked one hundred MLB innings before his triumphant return stateside last year. St. Louis president of baseball operations John Mozeliak obviously felt quite good about the organization’s pitching depth on the whole. But he did make one new acquisition to boost the pen, placing a sensible bet on veteran lefty Andrew Miller. The multi-inning relief ace was limited by a balky knee last year and just wasn’t as sharp as usual. If he can recover some of his lost velocity and get batters to start chasing out of the zone again, Miller could be a bargain. Even if not, he still ought to be an effective relief arm so long as he’s able to stay on the field. Otherwise, the Cardinals picked around the edges of the roster. They decided to give another year to veteran Adam Wainwright to buttress the rotation — which ultimately made it easier, at least in the short term, to part with Weaver. Veteran receiver Matt Wieters was added late in camp; he beat out Francisco Pena for the right to spell Molina here and there. Drew Robinson was snagged as a utility option, while the team also made low-risk depth moves for hurlers including Ryan Meisinger, Mike Hauschild, Chris Beck, and Tommy Layne. There aren’t many holes on this roster. As we touched on at the outset, though, that isn’t really the question. It’s this: did Mozeliak and co. do enough? The Cardinals play in the most competitive division in baseball, from top to bottom. While most would tab the Reds and Pirates as underdogs, both project as approximately average teams. The Brewers and Cubs have their warts, but those teams won 96 and 95 games apiece last year, respectively. There’s ample wild card competition in the rest of the National League as well. While adding Goldschmidt is precisely the kind of move the Cards could and should have made to put more wins into their lineup, it’s arguable they should have done more. A spirited pursuit of Harper or Machado may still have made sense. Had they gone big with another acquisition, the Cards could have used any displaced players as trade chips to boost the pitching. Or, the team could have gone straightaway after high-end arms in free agency or trade. A significant rotation upgrade, high-end closer, or multiple top late-inning relievers could all have made sense. Heck, perhaps they still ought to be in on Craig Kimbrel. Going with the existing options was certainly defensible in many respects, but the Cardinals will need some things to go their way to take the NL Central. The organization continues to pump out young arms, but they’ll be put to the test to a greater extent than had been hoped due to ongoing injury issues for Carlos Martinez. When he’ll be back isn’t known. Neither can we guess at this point what the team will get from the aging Wainwright, oft-injured Michael Wacha, or still-raw Dakota Hudson — a groundball monster who won the final rotation spot in Martinez’s place. Alex Reyes is a fascinating talent but will be handled carefully after a brutal string of injuries. He’ll be in the pen to open the year. Mikolas and Jack Flaherty were excellent last year but are (in quite different ways) still thin on MLB experience. The pen has some fire — Jordan Hicks, in particular — but would look that much better with a veteran closer sitting atop the depth chart. Otherwise, there wasn’t much need to spend on depth. The club opened with John Brebbia, Dominic Leone, and Mike Mayers supplementing the above-noted players as middle relievers and John Gant on hand as a swingman. There are some veteran pieces available if any of those arms falter; in addition to the minor-league signees, the club held onto Chasen Shreve after bumping him from the MLB roster and could still hope for contributions from rehabbing, high-priced veterans Brett Cecil and Luke Gregerson. It’s hard to quibble with any of the position players on the roster to open the season; all seem like quality big leaguers. But it’s hard also not to wish that there was one more star-level performer in the mix, with the other players all bumped down a peg on the depth chart. There’s a plethora of ~2 WAR projected players on the roster. If deployed with precision, perhaps the exceedingly deep mix of individuals will play up as a unit. But truly optimal usage is difficult to pull off. The potential lineup issues are most obvious in the outfield, where the Cardinals feature two bounceback candidates (Marcell Ozuna and Dexter Fowler) who realistically weren’t going anywhere after tough 2018 seasons. Harrison Bader impressed as a rookie, but projection systems expect his bat to take a step back with the bat; it’s the opposite situation for Jose Martinez, a highly talented hitter who probably ought to be on an American League roster. Tyler O’Neill has a chance to be the most productive member of the bunch, but he’ll have to pare back the worrying volume of strikeouts he ran up last year and prove he can overcome the adjustments of MLB pitchers. The Cardinals have already spun off a number of other outfielders in recent seasons — Tommy Pham, Randal Grichuk, Stephen Piscotty, Magneuris Sierra — and yet still seem to have a mix that’s deep but potentially lacking in top-end pieces. It’s not altogether dissimilar in the infield, though it’s easier there to see why the Cards held pat. Matt Carpenter was the team’s best player last year and is an easy choice to pay nearly everyday. They already locked into Paul DeJong with an extension. There’s a sensible platoon match at second between Kolten Wong and Jedd Gyorko, with the latter joined by Yairo Munoz as utility pieces who can also spell DeJong and help keep the older corner players fresh. This club has every hope of returning to the postseason. But it would hardly be surprising to see another disappointing conclusion to the year. It seems fair to say the front office could have pushed harder to boost the near-term outlook, though that would have meant giving up future value in a trade and/or further expanding an Opening Day payroll that is already topping $160MM for the first time in club history.